I was at the library yesterday looking for some new books for the kiddo and I stopped by the Hanukkah display and looked through a few titles. I find that books are one of the easiest ways to introduce topics and ideas to children and adults! My child LOVES historical fiction and as a result we've gone from a love of Laura Ingalls Wilder to reading Tales from Maple Ridge series about another pioneer boy, Blast to the Past series -- which has multiple famous people put into stories, the Who Was? series - where she has devoured the stories of Martin Luther King, Jr., Coretta Scott King and Malala Yousafzai. Of course these have bounced into other books and others. While she is entertained and improving her reading, she's also learning empathy, struggles of past generations, and how people stood up for themselves. I'm pretty proud of my kid and my job of leading her to viewing the world as not 'just our way,' but a place where so many viewpoints are and how they get to those viewpoints. Simon and the Bear caught by eye as it was one of the prominently displayed books, but as soon as I turned the page the illustrations grabbed me. I didn't pre-screen it, so we sat down to read it last night and wow. The book starts out with Simon getting ready to leave his homeland and his mom giving him food and a menorah to take with him to the new world. As he is on a giant ship, it hits a lifeboat and Simon gets the last place. A man is right behind him wanting on but isn't allowed. He throws a watch to Simon and asks him to give it to his son when he gets to America so his son can remember him. Simon who has grown up without a father, knows this is no way to remember a father so he jumps up, gives up his spot and returns the watch to the man. Right as the ship is about to sink he jumps off and miraculously lands on the iceberg. Simon is scared because he is all alone and is sure he will die here. He remembers it is the first day of Hanukkah and lights his menorah. Far out in the water he sees the shape of a ghost and a bear appears on the iceberg. Simon shares food with the bear so that the bear won't eat him. The bear keeps Simon warm through the night and the next day the bear brings back a fish to share with Simon. This continues on for a week. 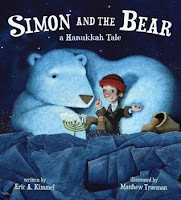 Simon lights the menorah, the bear returns with fish and the days repeat. Simon is worried that the bear won't keep returning and that now it is the last night of Hanukkah he won't have light from the menorah. But a final miracle occurs and a boat has seen his light. He gets to America and is reunited with the man who took his spot in the lifeboat. He happens to be the mayor of New York City. He pays for Simon's family to come to America in first class and gives Simon a job. Such a beautiful story that incorporates the Hanukkah traditions with a story of hope, empathy, and the rewards of helping others. The illustrations are TOP NOTCH. Highly recommend. What holiday books do you enjoy reading with children? What are your favorite children books currently?